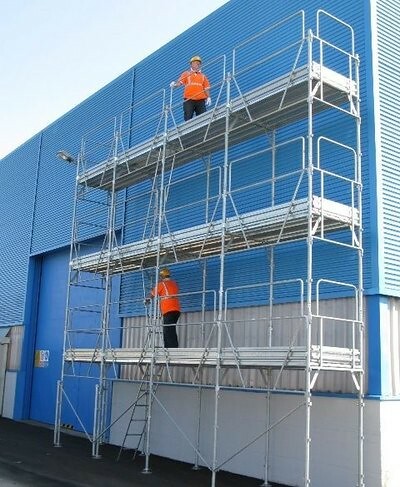 A Scaffold Tower is a platform that rests on horizontal rails connected to four uprights supported by base plates if the structure is fixed or on wheels if it is mobile. It is used by the painters and other workers who make light work, of limited duration, usually in one place. Scaffold towers are now made in a number of shapes, sizes and specifications to suit domestic use. Installing guttering, removing windows, accessing your chimney, painting or conducting any form of exterior work are all home improvements in which a scaffold tower will provide huge safety benefits to your work. 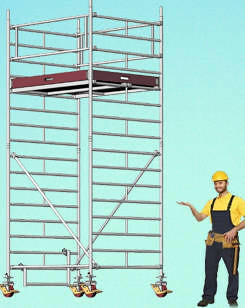 Scaffold towers cut the annual rate of deaths and injuries caused by ladders every year. The surface on which you are likely to erect your scaffold tower is outside of the home, where the ground surface can be anything from grass, to paving. Working at height on unsteady ground will increase your chances of injury. A scaffold tower has legs can be adjusted to make sure it is as steady as possible on most types of ground. Locks on their legs to make sure the towers does not move once they are in position, to give you a very firm and steady hold and prevent the risk of falling. Many people think that in order to use a scaffold tower they will need to surround the whole house in the way professional builders do. For DIY work and general use, scaffold towers come with lockable wheels which allow one tower to be moved around the house to reach different parts, giving you accessibility to all areas of the house in the same way a ladder does only with infinitely more safety and security. They also come in small and large sizes to fit into the space you need. Trap doors on scaffold towers make sure that even if you do slip, you will not slip very far! The trapdoors on scaffold towers open upwards so they can hold your weight whilst you are standing. The extra security enables you to be more mobile when you are at a height. Grip resistant bars on scaffold towers make sure that you do not slip or slide when you are climbing up and down the scaffold, and are extra handy if it starts to rain. Exterior work means that it is highly likely that you will need some form of equipment with you. Standing on a scaffold tower is like standing on a balcony which means that you can take your tools up with you, saving repeat trips up and down from your workspace to your toolkit. 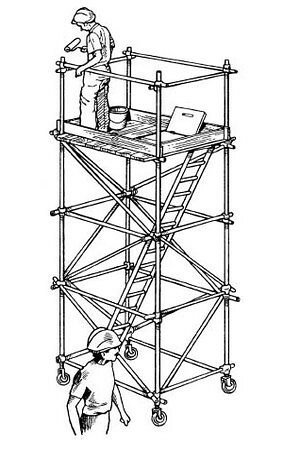 Scaffold towers are built with ladders on either side for access. Motorised scaffold towers have the same safety features and a remote controlled motorized lift installed allowing you to move up and down in a lift cutting out any climbing needed to access your workspace. Ben writes about safety and home improvements. 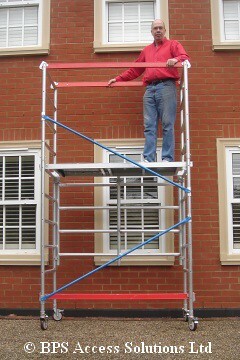 He works for Best at Hire who specialize in ladder hire.